The game-influenced menu plays into the hunting lodge's environment but also allows ample choices for those not fond of wild flavors. : Rough Creek Lodge, an ultra exclusive executive retreat and upland bird hunting facility, is set on 11,000 acres about an hour southwest of Fort Worth. A drive that far for lunch or dinner might give pause to some, but be assured a meal prepared by executive chef Gerard Thompson is worth every mile of county road covered. Chef Thompson returned to Texas from Santa Barbara, CA, where he established a top-notch reputation for himself and the Stonehouse restaurant at San Ysidro Ranch. He assembled a team in Glen Rose to repeat that performance. 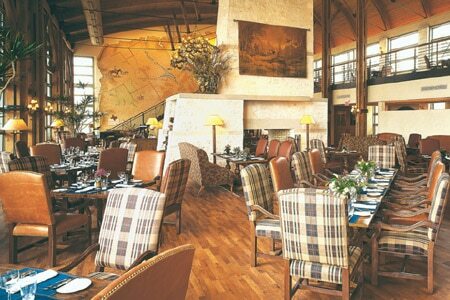 Floor to ceiling windows capture a view of Mallard Lake and a terrace where guests take their meals in cooler seasons. Furnished in sophisticated western comfort, the rooms hold oversized sofas and club chairs covered in glove soft leather and earth tone fabrics accessorized with kilim rugs, cast iron and silver. A soaring 40-foot limestone fireplace segments the room adding an intimate feel to each side. Without a doubt the menu is game-influenced, but there are ample choices for those not fond of wild flavors. Seared Hudson Valley foie gras with pheasant ravioli, sautéed greens and black mission fig compote is a statement starter. Entrées like the pan-seared ring neck pheasant with Portobello mushroom risotto is served with an enriched lemon-thyme sauce. Fusion influence is offered in gulf red snapper pan-seared and flavored with spicy ginger hoisin sauce accompanied by wasabi-mashed potatoes and tempura veggies. All breads and desserts are made on premises. A spectacular ending is the made-for-two chocolate sampler composed of Valrhona's best prepared in a truffle cake, a mousse tower and sorbet. The wine list, while nicely constructed, is a bit distracting due to its sort by bin. The wine steward and wait staff are professionally friendly, demonstrating a sincere desire to please.